Terror in Resonance depicted the Aomori prefecture of Japan as a perpetually snowy and miserable locale perfect for governmental agencies to conduct secret nuclear weapons research, but this is a gross over-generalisation of the prefecture as a whole. Granted, being the northern-most prefecture on the Honshu does subject the prefecture to heavy snowfall and has a relatively cool climate, and its rugged terrain results in Aomori having a lower population density. However, this also corresponds with mountains and lakes that remain quite pristine: it is amongst the quiet plains of western Aomori that Flying Witch is set: the events of the anime are set in and around the city of Hirosaki. With a population of 176590 (September 2015 estimates), the town’s castle and surrounding cherry blossoms are the central attractions — during Golden Week, there is a cherry blossom festival held near the castle. Hirosaki is also known for its agricultural sector: besides rice, the Hirosaki region accounts for nearly a fifth of Japan’s apple production. The area has been populated since the Heian Period, and Hirosaki was renamed several times over the course of history: its current moniker was adapted in 1808 from its former name, Takaoka. Besides the Hirosaki castle, the town is also home to a collection of Western-style buildings dating back to the Meiji restoration. With its humid continental climate, summers in Hirosaki are hot, reaching a daily average of 23°C in August, while winters are mild in comparison. Moving from the hustle and bustle of Yokohama to the comparatively quieter Hirosaki region marks a substantial change of pace. I live in a city of around a million people; it’s a fine balance between the quiet of a smaller town and the energy of a larger town, and I am quite happy with the city. With this in mind, the city sprawl, arising as a consequence of (presumably ill-informed) consumer preference, is very grating, since it drives up the costs of infrastructure. There’s more surface area to cover for power grids, water, transportation and sanitation, increasing the costs per person, but not everyone shares my views, and some former classmates have lectured me for not supporting subdivision growth. Of course, I couldn’t give two hoots about their opinions, so we won’t peruse that topic further. 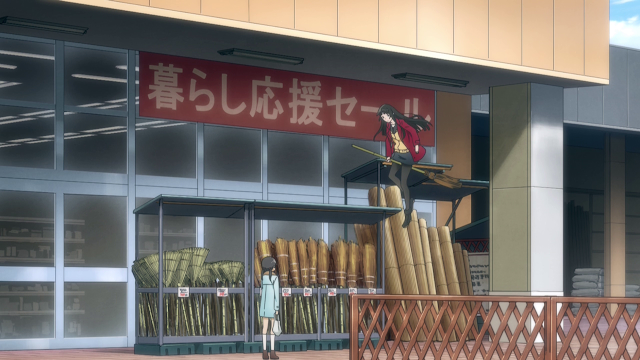 Back in Flying Witch, here is a local shopping center where Makoto goes to purchase a broom for travel. The placement and storefronts of the anime incarnation closely resemble the real-world counterpart, which is located in Hirosaki’s western edge. 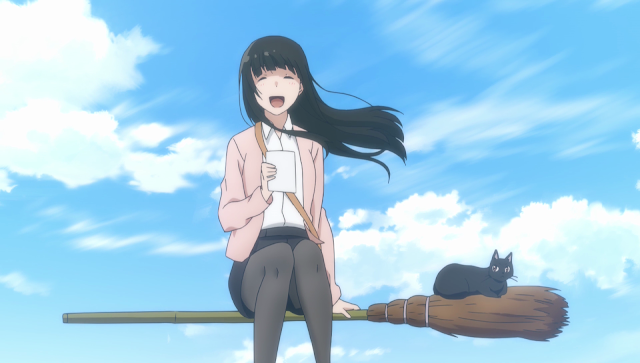 While brooms are typically depicted as magically enhanced to be capable of flight, Flying Witch suggests that they act as conduit for magic, so a skilled Witch need not ride the broom, but can fly merely by touching the broom and willing themselves to fly. While initially mistrustful of Makoto, Chinatsu warms up when Makoto agrees to take Chinatsu to her favourite doughnut shop in the mall. The real-world equivalent is a bit more ornately decorated, compared to the more conservative colours seen in the anime version, but the resemblances are quite apparent. Us Canadians are said to consume the most doughnuts per capita of any country on earth (Japan comes in second place), and this is partially owing to the presence of Tim Hortons in the country. While on a walk, Makoto crosses a bridge over a small canal. A handful of these canals cut through Hirosaki, and a cursory glance at the city reveals that it is mostly low rises, with Hirosaki Castle and Park at the heart of the city. Makoto’s penchant for getting lost is a personality trait that is gradually phased out over the course of the series as she grows familiar with the area, although she still enjoys taking things at a casual pace and can appear to be going off-mission. On her walk to a local fabrics shop, Makoto runs into Nao, who is on a delivery for her parents. With a maximum east-west distance of around 6.5 kilometers and a north-south distance of 6.9 kilometers (to traverse those distances would be a short 10 minute drive assuming light traffic at 50 km/h), Hirosaki is not a particularly large town, and so, one could make their way around town by bike. The city is built in the Tsugaru plains, and being relatively flat, making this trek more straightforwards than back home, where the hills and valleys present a bit more of a challenge for cyclists. Café Concurio is modelled after Hiarosaki’s Taishō Roman Tearoom (大正浪漫喫茶室), located a short ways from the southwestern edge of Hirosaki park inside the Fujita Kinen park. Its naming is derived from the Taishō period in Japan — running from 1912 to 1926, this period was marked by the convergence of Japanese and Western culture thanks to increased exposure to foreign elements, reinforcing Japanese cultural values while integrating aspects from the west. It is a highly romanticised period, hence the moniker “Taishō Roman”. The interior of the tea room is faithfully reproduced in Flying Witch, although in Café Concurio, the lights are dimmed, and only natural light illuminates the interior. 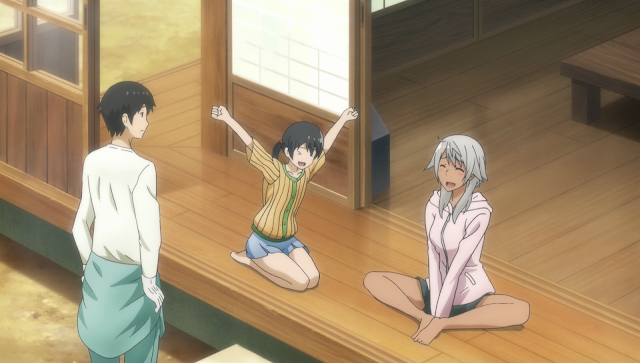 Beyond differences in lighting, elements in the real-world equivalent make it into Flying Witch, whether it be the wooden paneling of the walls, or the stone fireplace and its attendant decorations. 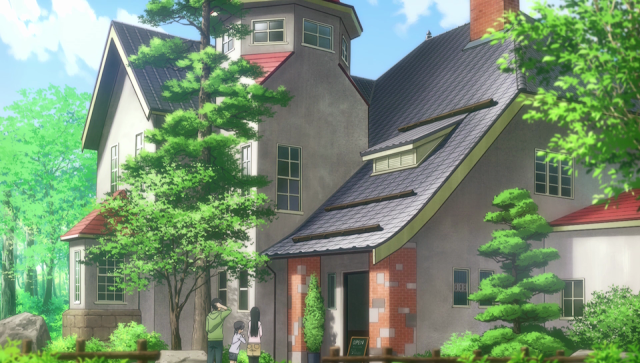 The major difference between the two cafés are their location: the real world tea room is located at the heart of Hirosaki, while in Flying Witch, Café Concurio is located in a quieter area. The Taishō Roman Tea Room is popular amongst locals, who note that the apple pie sold here is of a particularly excellent quality and some have even claimed the Taishō Roman Tea Room’s apple pie to be the best in the city; the tea room is often crowded as a result, and naturally, the terrace seats offer the best environment to enjoy an apple pie under. With this in mind, the number of patrons means that it can be difficult to get a seat here, and while Café Concurio is depicted to be very quiet, allowing Makoto, Kei and Chinatsu to sit in the terrace, at the Taishō Roman Tea Room, some patrons sit in the inner areas during busier hours. Aside from their apple pie and coffee, the Taishō Roman Tea Room also serves a variety of pastries and some hot meals. While the tea room appears to be hidden in plain sight, some English-speaking patrons have noted that the menu, while limited in variety, is excellent: the tempura soba is said to be unparalleled, and the owners speak English. Between the atmosphere and quality of the food, the Taishō Roman Tea Room seems like a location worth visiting should one ever be in Hirosaki: to really have a Flying Witch experience, one merely needs to visit the nearby Hirosaki Park by morning, and then stop by the Taishō Roman Tea Room for lunch. In Flying Witch, Café Concurio is given a Harry Potter treatment in that it is bewitched to be hidden away from Muggles, and it is Makoto’s knowledge of magic that allow Chinatsu and Kei to visit, bringing to mind how Witches and Wizards conceal their locations in the Harry Potter universe using a variety of spells, with Diagon Alley being the most famous of these locations. Access is controlled by a woebegone-looking pub known as the Leaky Cauldron, and there is a special brick that must be tapped in order to reveal the entrance. Construction on Hirosaki castle began in 1603, but following Ōura Tamenobu’s death a year later, the project stalled until Tsugaru Nobuhira resumed the project in 1609, finishing the castle in 1611. It was destroyed by a lightning strike that subsequently ignited a fire in 1627, and it was not restored until 1810. A large park surrounds the castle and is home to a large number of cherry blossoms that have made the park famous: towards the end of April and early May, the park’s 2600 cherry trees come into bloom, receiving upwards of a million visitors over this time-frame. Makoto flies over Hirosaki Park’s southern edge en route to a fabric shop, and Sannomaru Ōtemon Gate is visible here. This particular image was captured from a staircase on Hirosaki’s Tourism Board building, close the public library. Makoto, Chinatsu and Kei enter the park via the Sannomaru Ōtemon Gate, one of the five surviving gates to the castle. Located on the park’s southern end, the gate’s assembly and surroundings is rather similar to that of the Kitanokuruwa gate in the park’s northern edge, which directly faces the city (there is a small parking lot in the park’s southern end). This is one of the ponds in Hirosaki Park: details such as the crookedness of the tree and the placement of ornamental shrubs are meticulously captured to reproduce actual elements from the area, and I imagine that locals familiar with the park would have no trouble picking these details out. A ways back, Gundam: Iron-Blooded Orphans did a scene using Edmonton, Alberta as the setting: our neighbours to the north immediately identified which buildings and locations downtown served as the backdrop for the anime’s events. Originally opened in 1894, the present-day facilities at Hirosaki Station were completed in 2004 and as of 2012, has a daily ridership of around 4500. The nearest hotel, visible here to the right, is the Art Hotel. A four star hotel boasting modern facilities, it is located approximately 1.67 kilometers (just a hair more than a mile) from Hirosaki Castle and would only necessitate a 15-20 minute walk to reach. A bus terminal lies just outside of the train station: Makoto takes the number five route, which takes ridsers to Namioka, Goshogawara, Onoe, Kuroishi, Okawara and the Aomori Airport. This scene brings to mind an experience I had during my Cancún conference: I had arrived at the George Bush International Airport and realised I had forgotten to arrange for transportation to the zona hotelera from Cancún International Airport. Armed with an iPhone and Google-fu, I managed to book a private shuttle that ended up costing around 50 USD for a round trip. The lessons learned there is to do my research before taking off: after I sorted that out, the Cancún conference turned out to be much smoother than Laval, as my hotel was located right beside the conference venue. In Laval, owing to our last-minute bookings, a colleague and I only managed to get a hotel at the outskirts of town. It would have taken around three quarters of an hour walk this distance, but we later found a bus that took us close to the conference venue. This guardrail may seem unextraordinary, and by all counts, it is an ordinary guardrail. What makes it special is the fact that Makoto, Chinatsu and Akane are going whale watching and make a brief stop while trying to locate a sky whale. While Edmonton has been featured in an anime now, I wonder if Cowtown will do the same: our city’s still-futuristic downtown core, with its glass buildings, was featured in the 1983 film Superman III and 2001’s Exit Wounds. Neither film turned out to be critically acclaimed, and the latter turned out hilarious for trying to pass off Calgary as Detroit. If an anime were ever to use locations from Calgary, I would notice almost immediately. Back in Hirosaki, a bridge provides a vantage point, looking out over a river canal. Besides providing an excellent side-by-side comparison of anime locations against their real-world equivalents, the location posts I do also offer a prime opportunity to showcase some of the scenery in anime through screenshots that are otherwise not selected (often, it’s a difficult decision) for use in conventional posts. Chinatsu and Makoto cross a small bridge en route to the shopping center on their first outing in Kamisukisawa, and this bridge is roughly five-decimal-four klicks from the centre on foot. This would make a fantastic walk lasting around an hour at a casual pace, and a year ago, while in Kelowna for the Giant Walkthrough Brain performance, I walked to the Kelowna Community Theatre from the Manteo Resort on both days of the presentation. While it would be a longer walk, it can also be quite pleasant. While one might imagine that it would be fairly straightforwards to recognise areas from one’s own town were it to be featured in a show, the truth is that even locals are unlikely to be familiar with every nook and cranny in their neighbourhoods. It is this reason that I am so fond of taking walks, and one of the best surprises was in fact from Pure Pwnage: while the show had portrayed Lanageddon 2005 as taking place in Calgary, for instance, it took me quite some time to work out that the setting was Bowness Community Center. It was during a Japanese cultural festival, when I visited the Bowness area myself, that things clicked together. 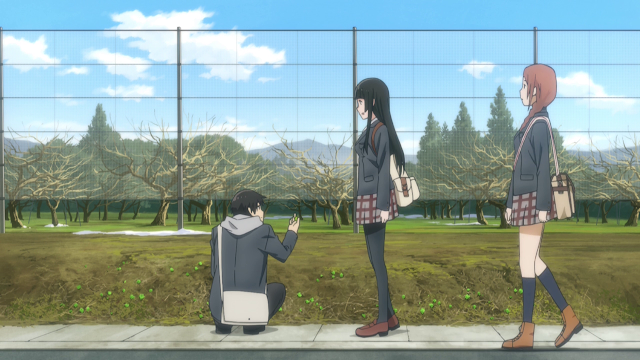 Nao finds Makoto under a pavilion during the fifth episode, after Makoto decides to follow Chito for a walk. 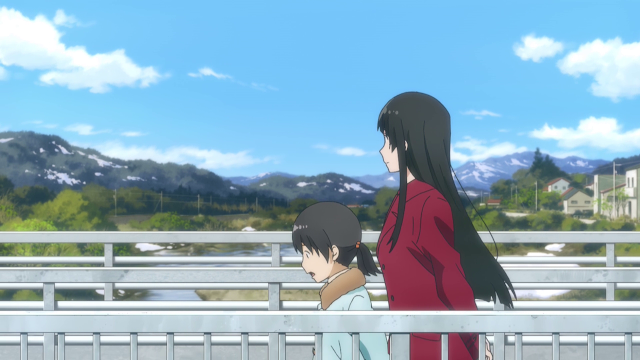 A cursory glance at a map suggests that locations in Flying Witch are closer than they are in actuality: this is typically done to give characters a chance to share conversations while walking to a destination, and I recall a café in Glasslip that was located much further from Mikuni than initially thought: it’s quite a ways away from the city where the characters reside, but the frequency of their patronage suggests that it would be within walking distance. Creative liberties such as these are perfectly acceptable, as they allow an anime to facilitate both its narrative while conveying a sense of realism (Glasslip remains an unusual exception! ), and back in Flying Witch, this view of Mount Iwaki is taken from near Apple Park. With a maximum elevation of 1624.7 metres, it is a dormant stratovolcano whose last eruption occurred in March 1863, and the summit can only be reached by hiking to the top. This trek takes roughly four hours to complete, starting from a shrine, although a more widely-used route involves a ski lift that takes hikers to within half an hour of the summit. There’s always a joy about visiting small towns for their tranquility, and while Hirosaki is not a small town (being only a shade smaller than Regina, Saskatchewan) by any definition, the outskirts of town have a very rural feel to it: it becomes difficult to tell where the countryside ends and the city begins until one is a ways into town. This stands in sharp contrast with Canadian cities, where build-up is found up to a certain point, and then abruptly stops, giving way to the countryside. 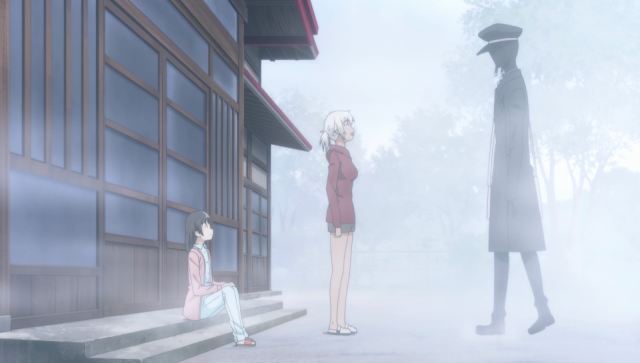 The Yuguchi Shinto Shrine is where Akane decides to provide some instruction to Makoto about spell casting: she’s taught a simple spell to summon crows in the third episode. As I’m not too versed with magic and magical lore, I wouldn’t know what the application of such a spell would be. Long considered to a symbol of respect for family in Chinese culture (孝), the crow’s call is also considered to be an ill-omen, and when I was an undergraduate student, I recalled a story where Cao Cao heard a crow’s call before his ill-fated campaign during the Battle of the Red Cliffs whenever hearing a crow’s call before an examination. Inspection of any pair of images in the location posts will invariably find that the photographs (top) are much more detailed than their anime counterparts: the real world simply has unmatched textures, detail and lighting effects. By comparison, anime locations often feel much cleaner, devoid of any visual clutter: the cleaner anime renditions make them less busy and allow for focus to be directed towards things that move (such as the characters). 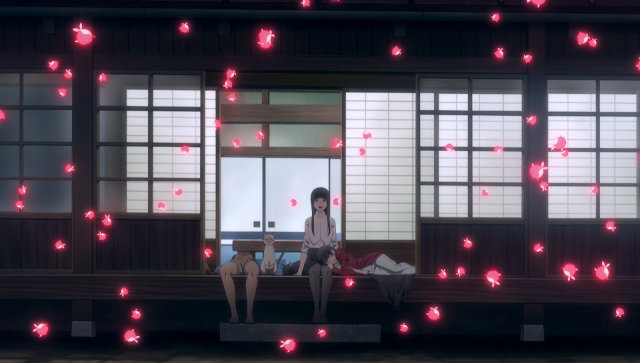 While well-known locations are expected to be reproduced with a high accuracy, one of the biggest draws about slice-of-life anime such as Flying Witch is that the artists go out of their way to ensure that even seemingly trivial locations are rendered such that they faithfully represent their real-world equivalent. 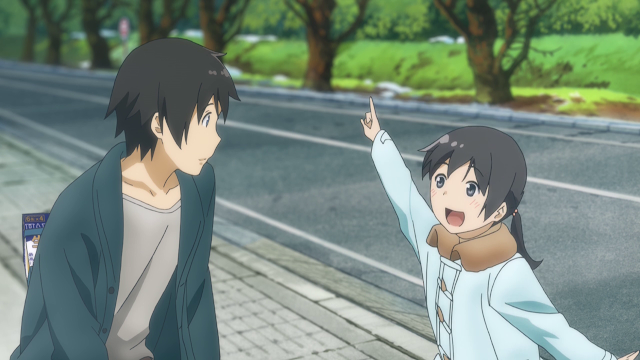 This is a small street that Chinatsu walks along while following Chito around on his walk during the fifth episode. The high school that Makoto, Nao and Kei attend is modelled after the Hirosaki Seiai Academy (弘前学院聖愛中学高等学校), with facilities for both middle and high school students. 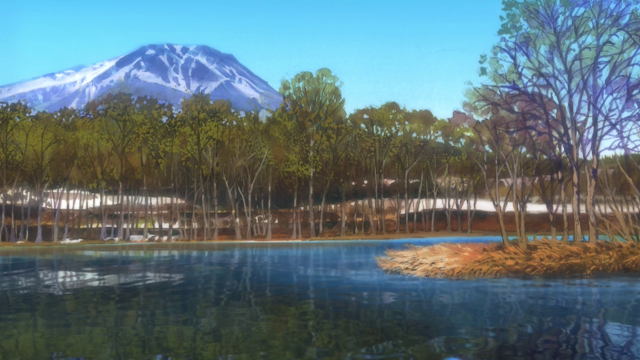 The school is located in Hiarosaki’s southern area, around 3.75 kilometers from Hirosaki park and seven kilometers from the locations where Makoto and Chinatsu share their first walk. 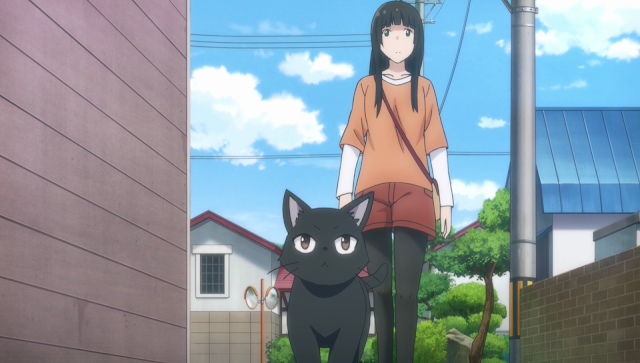 Makoto is seen frequently walking to school from her residence, another indicator that distances in the anime have been modified to better accommodate the atmosphere in Flying Witch. This is a Shinto Shrine in the Mount Iwaki area, an area steeped in mythology. The Slenderman Harbinger of Spring stops here briefly before continuing on with his travels, and the Shrine itself officially encompasses the whole of the mountain. Established in 780, most of the present-day structures were built in 1694 with support from the Tsugaru clan of Hirosaki Domain. The shrine hosts the Oyama-sankei, a festival held annually during the autumn equinox with a parade from the shrine to the top of the mountain as its centerpiece where where pilgrims carry colorful banners and are accompanied by traditional drums and flutes. I’ll round this post off with an image of the Imaya Knitting and Sewing shop that Makoto stops at to purchase cloth for her cloaks during the finale. While nearly identical in terms of appearance, right down to the banner, placement of items and the storefront’s design, inspection of the Hiragana finds that the real shop is known as the Shimaya Knitting and Sewing Shop. 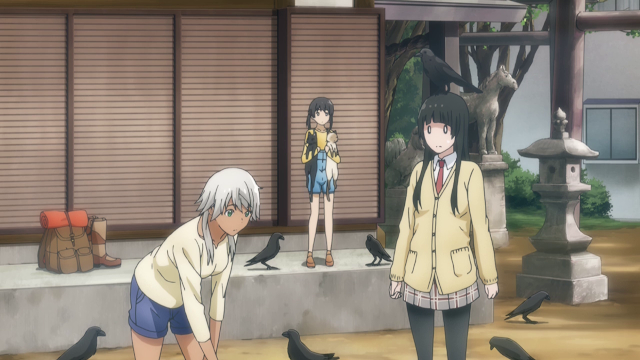 It’s been five months since Flying Witch aired, and I recall giving it a strong recommendation: there has been no news of a continuation, but I have had a chance to check out Flying Witch Petit, a short anime depicting the characters in chibi. With this Flying Witch location post finishe, this marks another anime whose locations have been presented in a manner accessible for English-speakers. My next locations post will be for Kimi no na wa: the photographs are ready, and all I need are high-resolution screenshots from the movie itself. A large part of the magic in Flying Witch, aside from the actual magic that Makoto practises, lay in how the choice of setting. Makoto is presented as a Witch who is very attuned to her surroundings, and as she is originally from Yokohama, the rural backdrop of Hirosaki offers her an opportunity to really explore the environment and master the disciplines required for becoming a fully-qualified Witch. 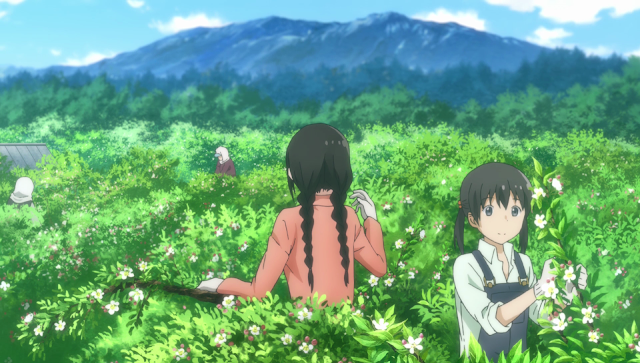 A great many discussions, my own included, do not fully cover this, but it is the tranquil, laid-back atmosphere of the countryside that allows Makoto to focus on her tasks: life in a city is rather hectic, which would have detracted from Flying Witch‘s theme that an effective Witch is someone with an open mind and a sense for adventure amongst nature. 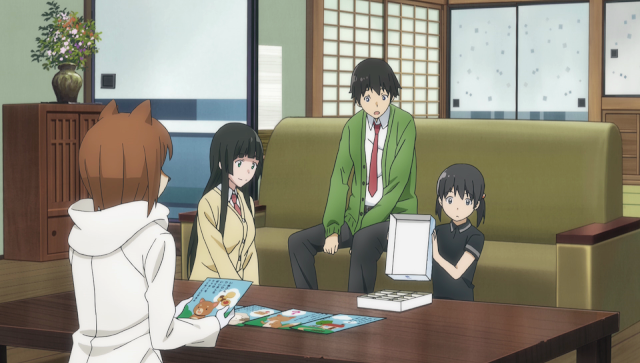 Consequently, it should be clear that the setting has a substantial contribution to the messages being portrayed in Flying Witch; the anime brings all of this to life, and while I’ve presently not heard of any news for a continuation, the manga is on-going, so it would be most pleasant to see what lies ahead in the future, especially considering how Chinatsu’s innate curiosity about Witches and magic later lead her to apprentice under Makoto. To watch her own journey as a Witch would likely be very enjoyable, considering how well-executed Flying Witch‘s first (and only) season is. 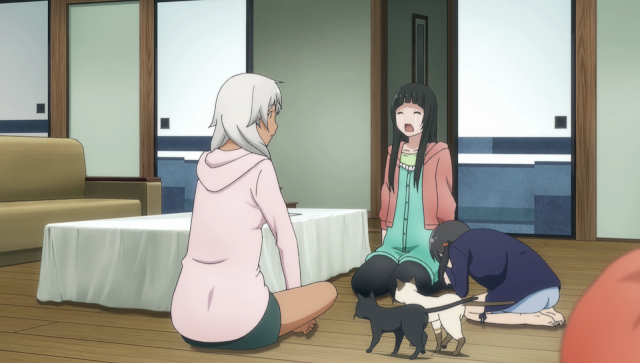 Proceeding past the third episode, Flying Witch earns its place as one of the most solid anime of the Spring 2016 seasons, and even as a contender for one of the best-executed slice-of-life anime I’ve seen. Continuing to following Makoto’s everyday adventures in Aomori with Chinatsu, Kei and Nao, everyone experiences together the different facets of Makoto’s witch training. Along the way, they meet Inukai, a girl who develops dog-like features during day hours undr the influence of a powerful spell she inadvertently invoked. As time wears on, Chinatsu, Kei and Nao join on Makoto’s adventures in greater frequency’ after Chinatsu follows Makoto’s cat, Chito, on a mini-adventure, she watches as Makoto learns to fly more effectively and volunteers herself in a magic experiment after wanting to become a witch herself. Together with Kei, Makoto and Chinatsu later visit a special café, read fortunes together, pick apples, fly to visit a sky whale and in the season finale, Makoto crafts a high-grade witches’ robe for Chinatsu before viewing land-fish gathering in anticipation of an upcoming festival. Flying Witch presents a novel take on magic that sets this anime as being quite distinct from J.R.R. Tolkien and also, more similar to that of J.K. Rowling. Commonplace in Western fiction as a powerful supernatural force, magic is portrayed differently according to the narrative’s requirements. In Tolkien’s Lord of the Rings, magic is an abstract power that higher beings such as the Maiar and Valar can wield to control natural forces or the will of beings. In his novels, magic wielders are oftentimes limited in how much of their power they can wield to avoid cataclysm in the physical world; Gandalf is forbidden from using his raw power against Sauron during the War of the Ring, and likewise abstains from taking the One Ring. Instead, he uses his magic sparingly to assist Frodo and the others in their quest, influencing Middle Earth’s history in a positive direction to release it from the threat of Sauron. Conversely, in Harry Potter, magic is regarded as a highly versatile utility for carrying out tasks, both everyday (cooking and cleaning) to practical (potions making, transfiguration, charms) or even combative (Defense Against the Dark Arts and the Unforgivable Curses). Witches and Wizards train to master these spells and other magical utilities in order to maintain their livelihoods, rather similar to how Muggles create technology of increasing complexity (household utilities such as microwaves or vacuums, concepts such as the scientific method, law, ethics and military hardware, ranging from assault rifles to cruise missiles, fulfil similar roles for us Muggles). As with Tolkien, the magic in Rowling’s writings are subject to different limitations and laws: Hermione mentions that food cannot be created freely as one of the exceptions in Gamp’s Law of Elemental Transfiguration, and similarly, Voldemort’s demise arises from him exploiting magic without understanding its implications. It becomes clear that magic in any fictional context can be quite cumbersome, but both Tolkien and Rowling do a fantastic job of crafting their own rules to ensure things remain plausible. In Flying Witch, the magic that witches such as Makoto and Akane wield are likewise subject to limitations and laws. 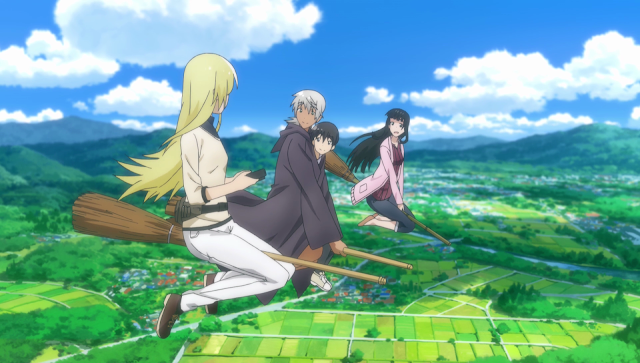 Compared to the abstractions of Tolkien’s magic, or the more commonplace, tangible usage of magic in Rowling’s writings, the magic in Flying Witch appears to be a low-key and subtle variation of Rowling’s magic: there are potions that can induce partial transfiguration (such as in Inukai’s case) or different emotions (such as one that causes Chinatsu to find everything hilarious), and spells that can summon crows. Brooms also exist, but for transportation alone rather than encompassing sport. However, in Flying Witch, magic is not quite so commonplace or as flashy as seen in Harry Potter. Makoto’s activites never draw too much attention, and in fact, magic is only one facet of her training. Despite being a witch, Makoto engages in a wide range of different activities; Akane notes that Makoto’s spellcraft is weaker and also helps Makoto learn about potions. The nature of Makoto’s witch training suggests that to be an effective witch is to be multi-disciplinary and well-connected with the nature in the world around one, far beyond simply just possessing a high proficiency with spells and potions as the stereotypical images of witches typically portray. 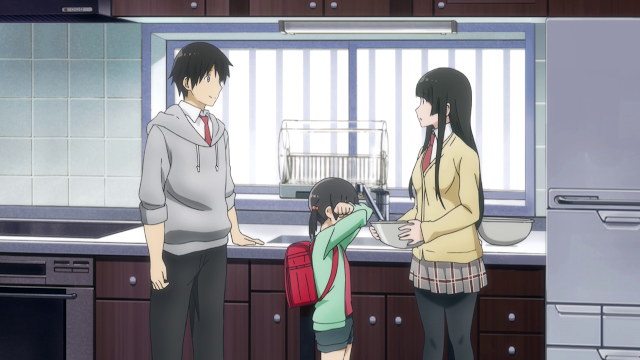 This attention to subtleties in one’s surroundings to observe wondrous things often going missed by others is shown time and time again in Flying Witch: Makoto points out various supernatural and uncommon occurrences to Kei, Chinatsu and Nao. These events are typically found right in their backyard or locally, showing that there can be interesting things nearby. Because familiarity breeds complacency, individuals often miss things in the areas they know well simply because they’ve grown accustomed to the scenery. In showing the different aspects of the world that witches know, Makoto’s role is meant to evoke the idea that beauty, splendour and novelty can be seen quite close to home: ranging from creating robes and picking apples to visiting a hidden café or welcoming the Harbinger of Spring, mandrakes and sky whales, with her around, Chinatsu, Kei and Nao experience truly spectacular things, as well as simpler but equally meaningful moments together with Akane, Makoto’s older sister. This Flying Witch review is a bit longer than the usual format: this is a series I can whole-heartedly and easily recommend to viewers of all sorts. As such, there’s a bit more space to talk about things, although even in this extended format, I nonetheless had to pick thirty screenshots from seventy (otherwise, writing this would take at least six hours). 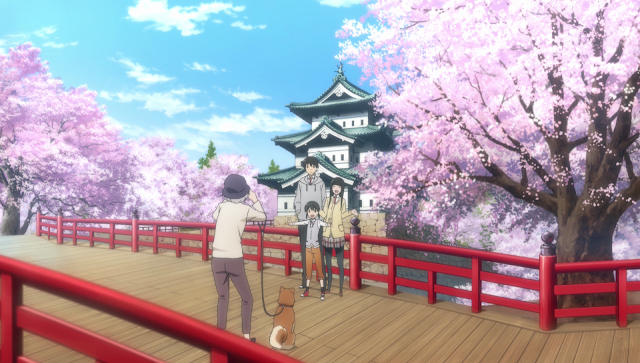 Here, Kei, Chinatsu and Makoto get their photograph taken at a temple by spring. Inukai is a full-fledged witch like Akane, and is proficient at card-based divinitation. She appears with dog-like features by day because she ingested some chocolates that Akane had made while drunk. Her condition only persists during the day, and she is restored to her human appearance by night. These features are said to wear off over time, and until then, Inukai dresses in a heavy coat to hide her appearance to avoid dissuading customers seeking fortunes. Despite being a traveller, Akane begins dropping by with increasing frequency as the series continues. 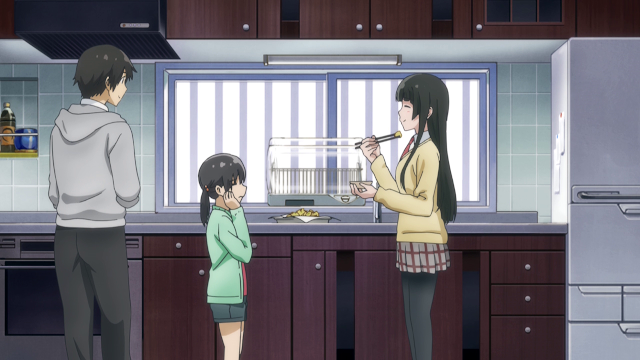 Here, she shares a morning meal with Makoto and Kei’s family: despite the presence of magic and supernatural elements, Kei’s family take things in stride. 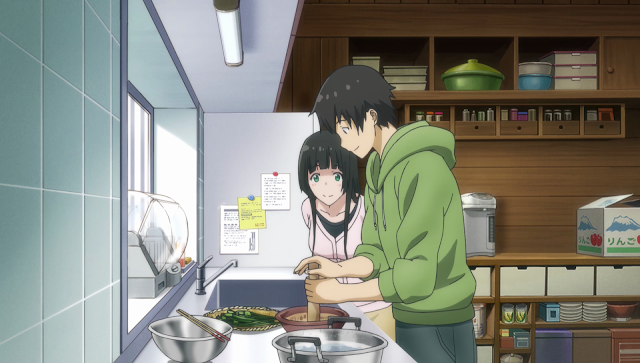 Various dishes are depicted in loving detail, and I recall sitting down to poutine perogies while watching Flying Witch back during May. Chito is Makoto’s familiar: these are spirits that, in medieval folklore, would aid witches in carrying out their magic. Seen as both malevolent and benevolent, they can take on different animal forms. Cats, dogs, mice and frogs are common, with a familiar entering a magically binding pact of sorts with a witch under most cases. 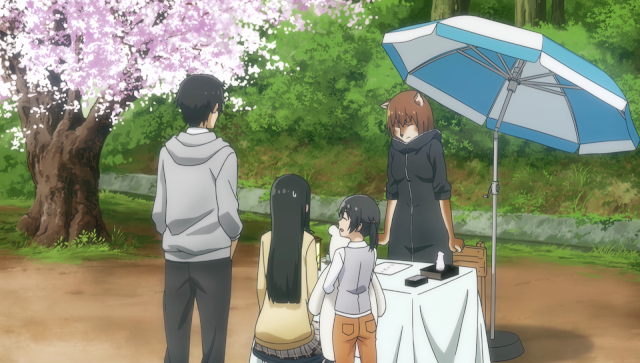 In Flying Witch, witches can understand what their familiars are saying, and here, Chito leads Makoto to an locale where cherry blossoms are fluttering about. Both Kei and Chinatsu are probably intended to represent the reactions of ordinary folk, or Muggles, to magic. Although both are initially surprised by the existence of magic, Kei accepts it quite quickly and Chinatsu becomes very keen to become a witch herself, exhibiting a great deal of excitement after Akane considers taking Chinatsu as a trainee. Chinatsu is absolutely adorable throughout the whole of Flying Witch‘s run and mirrors the boundless energy and curiosity in children. During one experiment, Akane gives Makoto candies that will induce crying. Chinatsu ends up trying candies that make her laugh uncontrollably. In Harry Potter, various potions and charms have similar effects on their recipients; Harry and Ron mention Cheering Charms in Harry Potter and The Order of The Phornix, and later in the novel, a calming draught is used to help students recover from the stress of taking the OWLs. However, magic is never shown as a force taking the forefront of all events in Flying Witch. In most episodes, Makoto also has opportunities to experience life in the Aomori region. Far from being a snow-covered, desolate region of Japan where secret weapon development programmes are carried out (as with Terror in Resonance), Flying Witch presents Aomori as a charming rural region that offers a completely different vibe than the well-travelled paths of Tokyo and Kyoto. After spending an afternoon picking Fiddleheads, Makoto and Kei prepare them for consumption. These sprouts of the Ostrich fern, Matteuccia struthiopteris, can be consumed after cooking; they’re supposed to have antioxidant properties, as well as omega-3 and omega 6 fatty acids, iron and fibre. They’re known as kogomi (コゴミ) in Japan and enjoyed during the spring. Café Concurio is a quaint establishment located a short ways from the Kuramoto residence. Like magical locations in Harry Potter, it appears as a decrepit ruin to a Muggle, but a simple spell transforms it into its proper glory. 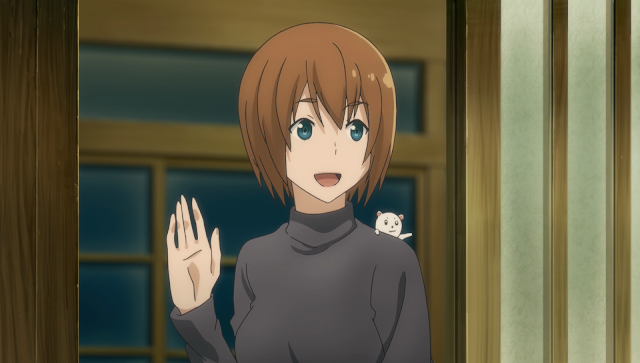 I’m not sure if there have been any instances of Muggles entering magical places such as Hogwarts or Diagon Alley in Harry Potter or its supplemental works, but in Flying Witch, being in the presence of a witch familiar with the area is sufficient to gain access to these special places. 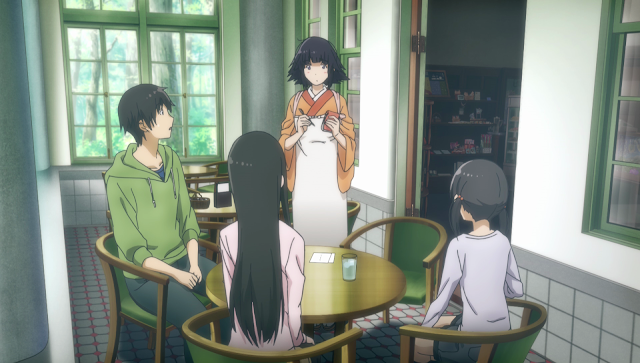 Upon learning their waitress, Hina, at Café Concurio is a ghost, Makoto places a spell to render her visible. Born during the Meiji Era, Hina has been around for quite some time and is quite shy, immediately retreating into the shadows upon learning that she’s now visible. The equivalent of a full episode is spent at the café, and despite this being a seemingly normal activity, Flying Witch transforms it into a very relaxing experience for the viewers, to reflect on how we visit such places to relax. The patronage at Café Concurio is a wonderfully diverse one, and here, everyone strokes a fox who’s attempting to enjoy his fare in peace. Earlier, a ladybug couple visit and order some nectar from thistles. They’re rumoured to bring fortune to whoever’s fingers they land on, so Makoto and Chinatsu spend a bit of time chasing them around. Inukai later returns to read fortunes for Makoto and Chinatsu. It’s a style that I’ve never heard of before, and I’m more familiar with Chinese fortune telling (which is not saying much, since I have no idea how it works). In the context of reality, fortune-telling is totally useless, being presented as vague and general enough to capture most events. In fiction, however, they can become rather more fun, as viewers can observe situational irony in some fortunes that are given. Inukai returns to a human form by nightfall, and bids everyone a good evening. Yesterday was Canada Day, and in previous years, I wrote dedicated posts for those events. This time, I’m leaving for Mexico tomorrow, so I’ve decided to push that reflection in with the Flying Witch reflection: yesterday was quite pleasant, despite an unreal traffic jam on the Trans Canada highway leading into Banff National Park. 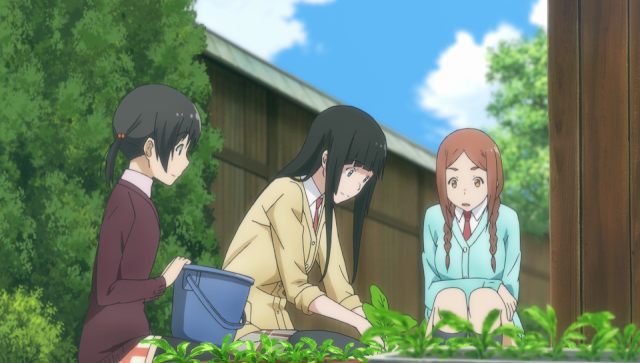 Makoto and Chinatsu pick radishes for Nao; it appears that Makoto’s herbology skills are reasonably good, as they’ve got a surplus of radishes. By the time we arrived, it was noon hour, but fortuitously, parking spaces were still plentiful. We parked, stopped for lunch (an Angus burger with hickory-smoked bacon and a smoky sauce for me) and then walked around the Banff townsite. The Banff Park Museum National Historic Site of Canada had free admissions and we stopped in there to take in the exhibits, before walking around the Bow River and stopping for maple-walnut ice-cream while waiting for the Canada Day parade to begin. After the Canada Day parade ended, we walked to Bumper’s Beefhouse for dinner to celebrate my defense’s outcome. It’s been eleven years since we last went, and they’ve moved since then. Their steaks remain as delicious as I remember: I ordered the 12 ounce rib-eye steak with a baked potato and prawn skewer. Every bite of the steak was tender, flavourful and juicy, and the salad bar was quite nice, too. Later that evening, Akane returns to the Kuramoto residence with souvenirs in tow for Chinatsu and Makoto, showing that Inukai’s fortunes turned out to be true. I’ve not taken a home economics course since my days as a high school student, but the activities I’ve participated in were fun and the skills and have made me more comfortable with cooking. I will definitely need to master the art of making simple but nutritious and delicious meals in the very near future, now that I’m nearly graduated and are seeking to move out within the next few years. 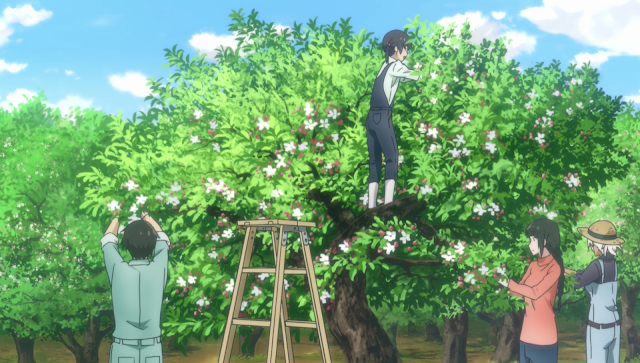 The Kuramotos, Makoto and Akane help with pruning the flowers on an apple tree to ensure the apples are of good quality. Back in 2007 October, I took a short trip to Kamloops during the Thanksgiving Long Weekend to watch the salmon runs, and one of the destinations on our itinerary was an apple farm, where we picked apples. At the time, I had braces, so I couldn’t eat the apples directly, but apple juice was an option, so I had some of the freshest apple juice of all time in lieu of apples. After climbing onto a step ladder to reach the higher flowers, Makoto is treated to a spectacular view of the landscape above the apple trees. The artwork depicting the landscapes in Flying Witch is spectacular and brings to mind the stills that were seen in Non Non Biyori. On a foggy morning, the Slenderman paperman drops by to deliver a newspaper. Chinatsu is no longer frightened by the wonderous things of Makoto and Akane’s world and here, wonders if the paperman is related to the Harbinger of Spring in any way owing to their similarities. According to Akane, the witches’ newspaper is packed with useful information ordinary newspapers lack (it’s probably better than the Daily Prophet), and I’m reminded of how electronic news in the Muggle world is rendering traditional papers obsolete. The paper that we subscribe to has shrunk over the years, and there are ads letting readers know that the full deal can be accessed via app or website. The news reveals that a sky whale will be observed overhead in Makoto’s AO, so with Akane and Chinatsu, they decide to see if they can spot it during the penultimate episode. 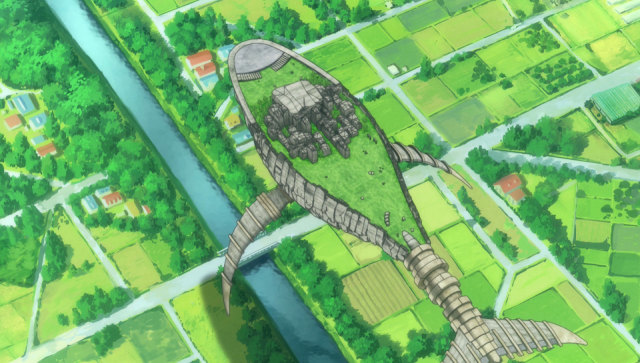 A large construct, the sky whale is reminiscent of Laputa in Miyazaki’s 1986 film, Castle in the Sky (itself inspired by Laputa of Jonathan Swift’s Gulliver’s Travels). Unlike those castles, where technological superiority led citizens to distance itself from society, the sky whales of Flying Witch serve a different purpose. This episode is one of the most beautifully animated among all the Flying Witch episodes; the landscapes of Aomori prefecture are shown in incredible detailed and coloured well to give the sense of an unending peacefulness. They explore some of the old structures in the sky whale and encounter Anzu Shiina (seen earlier at Café Concurio): she has a fascination with history and explains the sky whales were once homes for people and appeared more frequently. Voiced by Yuka Iguchi (Mako Reizi of Girls und Panzer and Tamayura‘s Norie Okazaki), Anzu’s voice has a similar attribute as that of Yuki Nagato’s in The Disappearance of Nagato Yuki-chan. It turns out that Anzu’s knowledge extends well beyond archeology, and she’s also familiar with the histories of a variety of things. Here is another shot of the tranquil skies above Amori: the penultimate episode was delayed by a week for reasons unknown, and some viewers have speculated that the incredible animation quality in this episode might be the contributing factor. 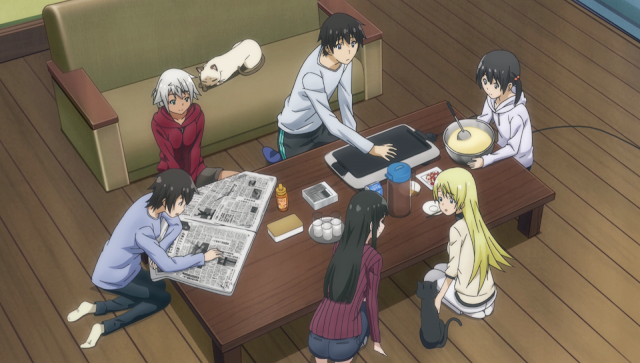 After viewing the whale, everyone returns to the Kuramoto residence for breakfast. Apparently, pancakes are perhaps one of the oldest known cereal-based food items, pre-dating even the ancient Egyptians and Greeks; the nomenclature “pancake” is more recent, being used in Middle English of the 15th century. Pancakes breakfasts are a staple of the Calgary Stampede, and around this time of year, they’re held by large organisations and retail shops in the days leading up to the Calgary Stampede. The finale returns to a quieter, lower key events that characterise Flying Witch: the penultimate episode’s events are more exciting in a relative sense. 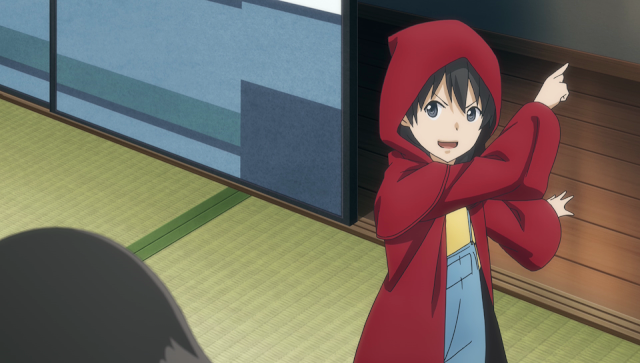 Here, while Makoto is maintaining her broomstick, Chito finds one of her old robes. Realising that she’d likely need a new one, Makoto decides to take the broom and visit a local fabric store. Although the acceleration and handling on Makoto’s broom is probably not comparable to that of a Firebolt or Nimbus 2001, by this point in Flying Witch, she’s gotten the hang of flying and can do so without too much difficulty, lending the anime its name. 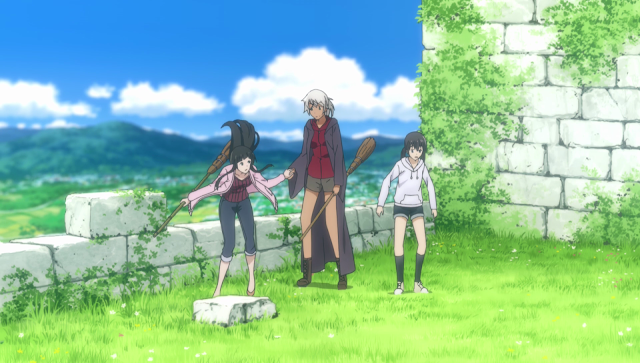 The brooms of Harry Potter are bewitched for flight, while in Flying Witch, the broom acts as a conduit of sorts for a witch’s power. After floating about in the sky and landing, Makoto runs into Nao, who’s out delivering liquor to her customers. Makoto asks her for directions and manages to arrive at her destination. 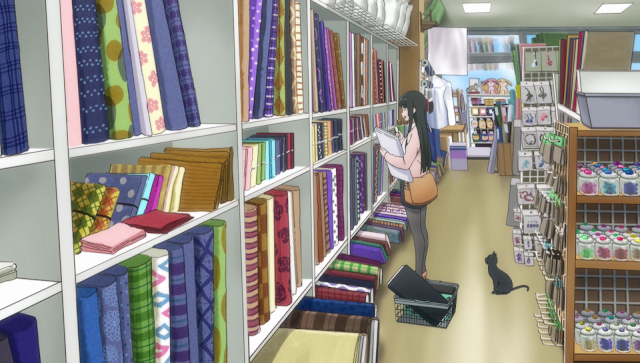 While she’s generally got a poor sense of direction, this aspect of Makoto’s character is lessened over time as she becomes accustomed to life in Aomori, and here, the interior of the fabric store is beautifully rendered, feeling very much like a fabric store in the real world. While Makoto does her best to surprise Chinatsu with a robe of her own, the latter’s curiosity leads her to persuade Makoto to let her know what’s going on. Makoto relents and allows Chinatsu to watch her craft the robe. With the robe completed, Chinatsu is thrilled and here, imagines herself casting spells as a witch. With Akane drunk from consuming so much alcohol and Chinatsu falling a sleep, Makoto shares a quiet moment in the evening prior to stepping out with Kei and Nao for a festival. She mentions that with the time that’s passed by, she’ll be required to do a progress report of sorts, akin to those that I’ve completed in the past two years for graduate school. I’m not sure what the contents of a report for witches would be, but mine entails my research’s directions, teaching and professional development, such as conferences. Before falling asleep, Akane explains to Makoto that these land fishes aggregate whenever a festival is about to occur. These fish seem fond of sake and behave similarly to conventional fish, but also begin glowing red and take to the skies, creating yet another beautiful sight for Makoto to behold. 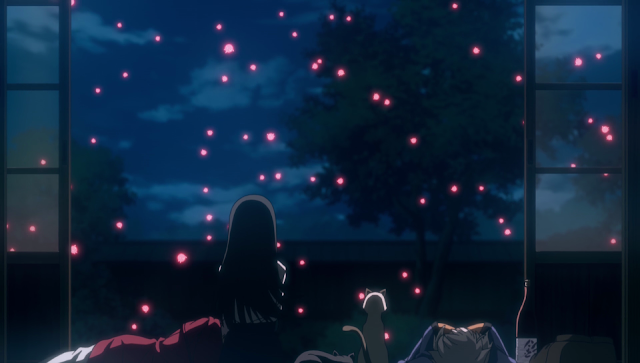 It’s the perfect ending to Flying Witch, and brings to mind the fireworks show I saw for Canada Day yesterday evening. This marks the end of the review for Flying Witch, and now that I’m packed, I’m set to board my flight tomorrow for Mexico. There’s been a minor hiccough with the online system, so I’ll try again later this evening before turning in, and failing that, I’ll get it sorted out at the airport. Other than that, I’m rather excited. Regular programming will resume when I return, and as I settle in to a new schedule, posting patterns may become a little erratic or sporadic. 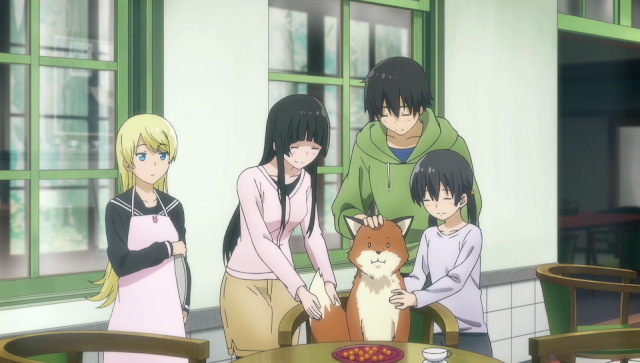 The verdict on Flying Witch is an easy one: it earns a strong recommend for all audiences for being able to capture the beauty and joy of the subtle, simpler things in life. Coupled with the peaceful setting of Aomori and its depiction in great detail, character dynamics that are warming and amicable, and a beautiful soundtrack that accentuates the atmosphere surrounding Aomori and Makoto’s everyday life, these elements combine to create a truly unique anime that appears to illustrate the interface between Non Non Biyori and Harry Potter in a completely new and welcome direction. Dispensing with typical anime tropes, Flying Witch chooses to intricately construct and present an incredibly detailed and noteworthy world that captures the audience’s interest. 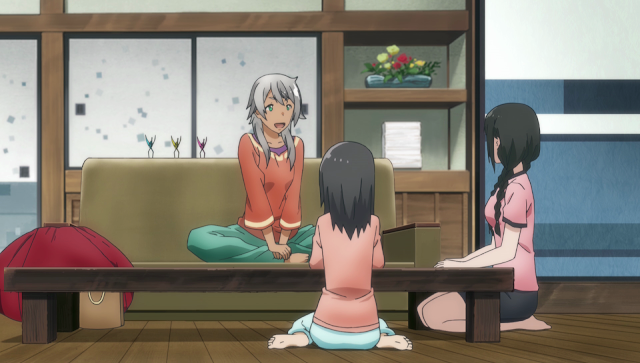 Then, the interactions among the characters allow Flying Witch to hold the audience’s interest. There are not many negatives that can count against Flying Witch, except perhaps that there isn’t a second season; all of these elements culminate to result in my final decision. Flying Witch is easily worth watching, and I note that for Minami Shinoda, her role as Makoto Kowata is her first. 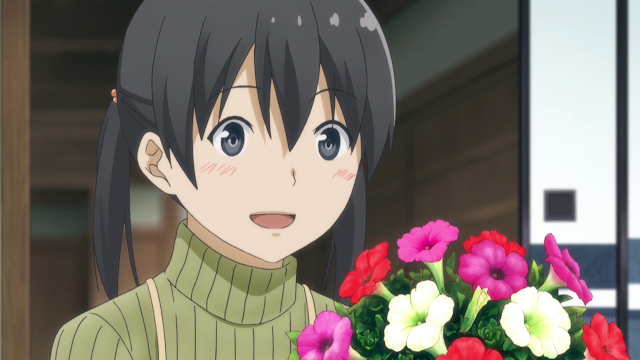 In spite of being new, she delivers a solid, consistently good performance in Flying Witch that does much to bring Makoto’s character to life. 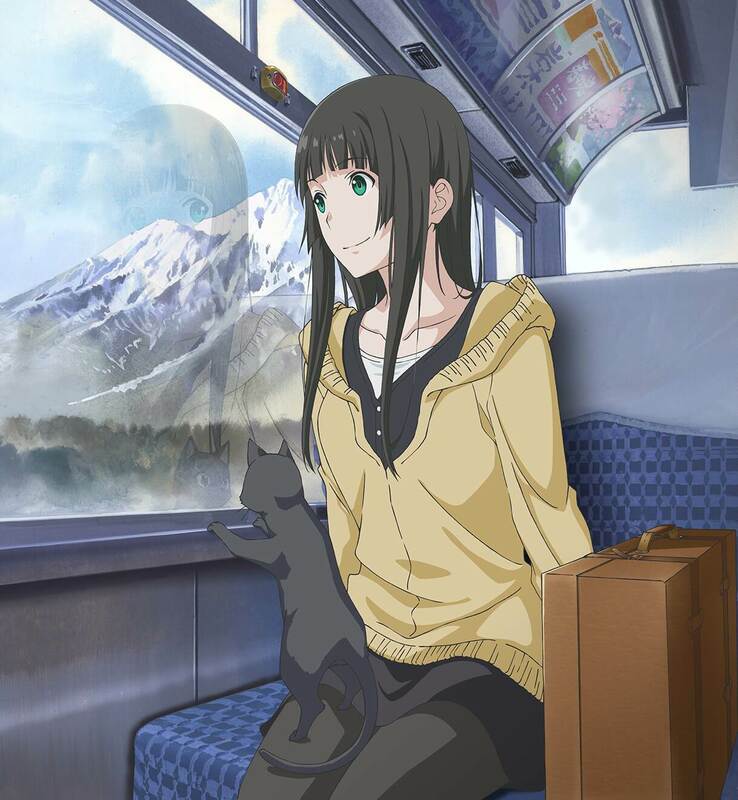 Set in the tranquil regions of the Aomori prefecture, Flying Witch follows Makoto Kowata, a young witch whose moved from Yokohama to live with relatives. Although she’s predisposed to getting lost, she nonetheless settles into life in Aomori, grows closer with her cousin, Chinatsu, finds a mandrake, introduces Chinatsu to the Harbinger of Spring, creates a small garden and learns a new spell from her sister, Akane. Unstructured, relaxing and quiet, Flying Witch has proven to be an unusual anime after three episodes, weaving elements from Non Non Biyori with subtle traces of magic; Makoto’s adventures always remains within the realm of what is plausible and as such, even though she’s a witch-in-training armed with a keen eye for the supernatural and magical abilities of her own, she nonetheless remains a consistent, realistic character whose optimistic, easy-going personality allows her to find adventures in her everyday life. However, despite being a witch, it would appear that Makoto and the other witches’ powers are limited in the sense that, while they are attuned to the more unusual things in their environment and can perform some magic, the witches’ magic is nowhere near as potent as that seen in the Harry Potter universe, nor is it as abstract as the powers that J.R.R. Tolkien describes his Istari as having. This balance ensures that Makoto’s everyday life is about the people’s she’s with and what she’s doing, rather than the magic itself. 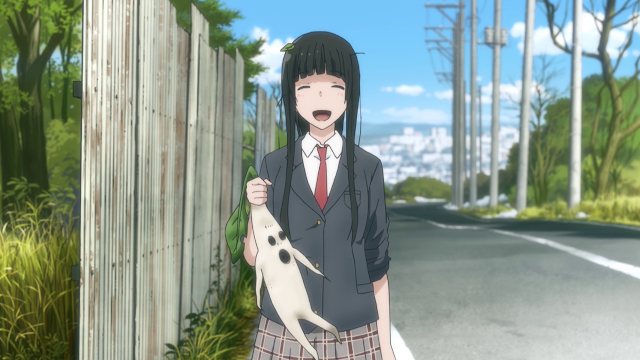 Flying Witch takes the familiar genre of rural slice-of-life and adds a bit of magic to provide new avenues from which Aomori can be showcased: Makoto’s adventures have been utilised to great effect in showcasing some of the more subtle elements in the Aomori area, such as when she and Kei gather fuki bulbs and fry them as tempura, or Makoto’s attempts to capture a pheasant while creating a garden. 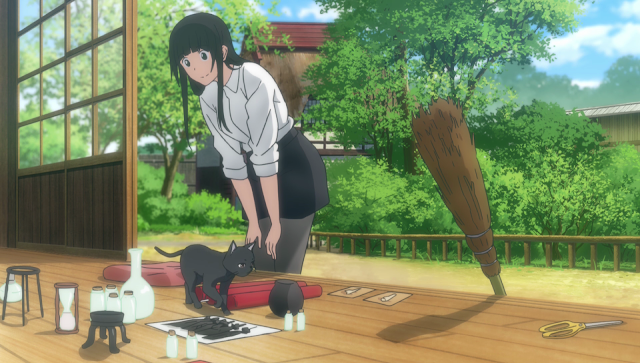 These small details would almost certainly be missed by most non-locals; Flying Witch capitalises on Makoto’s witch training as a catalyst that allows her (and the viewers) to partake in some of the more obscure but highly enjoyable facets of life in Aomori. With this in mind, Flying Witch might be seen as suggesting to its audiences that exceptional events and miracles can be closer than one might imagine, rewarding individuals who stop to savour the moment. Taken together, the combination of magic and the mundane complement one another to paint Aomori as a very calming, laid-back and beautiful prefecture in Japan. 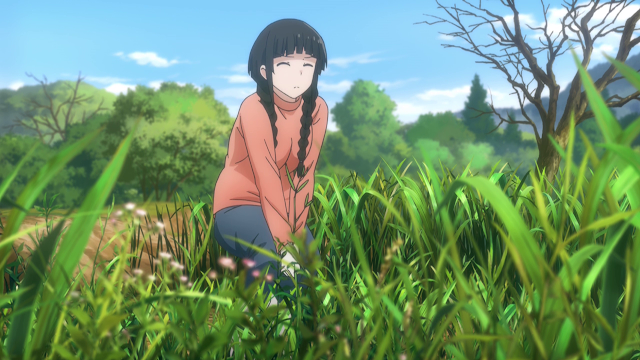 Flying Witch represents a welcome change of pacing from the likes of Hai-Furi; whereas the latter swings between suspense and comedy, Flying Witch is consistently peaceful. Makoto Kowata is the protagonist and is a witch-in-training who, unlike Harry of Harry Potter, prefers potions over spell-craft. This anime is based of the manga, which started in 2012. 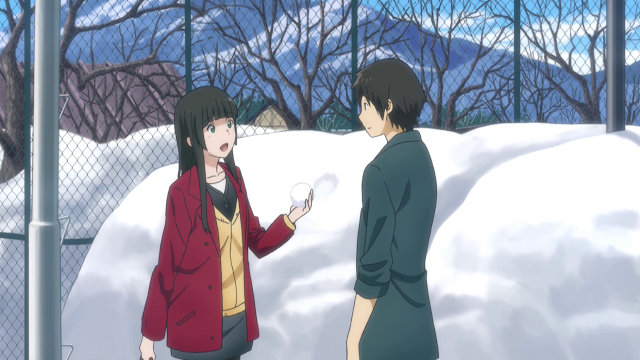 Here, Makoto meets with Kei for the first time in six years and expresses wonder at the amount of snow in Aomori: Makoto is from Yokohama, where December and January, the snowiest months of the year, yield around 2 and 4.8 inches of snow, respectively. My home city has an average of double that, but this year’s been unnaturally dry; only 10mm of precipitation was recorded for the past four months. Chinatsu is Kei’s younger sister and initially regards Makoto as quite strange for talking to cats. I wish that I could say that my city is as verdant and cool as Aomori, but the lack of precipitation’s been a curse; a massive forest fire of some 850 square kilometres in size is raging in the province’s northern regions, forcing the complete evacuation of Fort McMurray over the past few days. I’ve made a donation to the Red Cross to help with relief efforts and presently hope that the area gets some badly-needed rain soon. While Chinatsu is hesitant to trust Makoto, Kei’s suggestion that she accompany Makoto to the local shopping mall changes Chinatsu’s perspectives on short order. 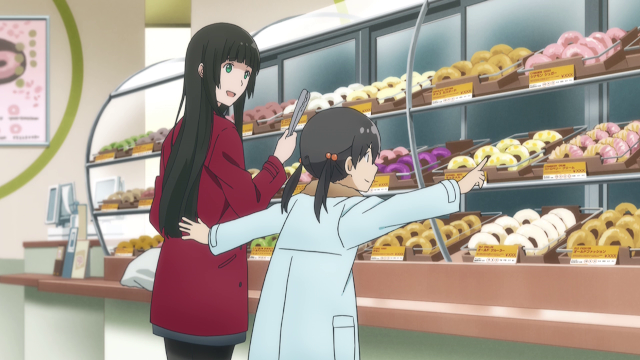 The two are shopping for donuts here, which Chinatsu are particularly fond of. The hole in a doughnut has unknown origins, but is present to allow the doughnut to cook evenly through by increasing the fried cake’s surface area. In keeping with the image of a witch, Makoto picks out a broom and takes flight on it. Her stance suggests that the broom is merely an apparatus for helping her fly, as she’s not riding the broom itself. The origin of this imagery has an interesting, if incomplete, history: some accounts suggest that accused witches often used their brooms or staffs to deliver hallucinogens, and were reported to straddle brooms in a manner evocative of flight. This imagery persisted, resulting in the modern image of a witch riding her broomstick. 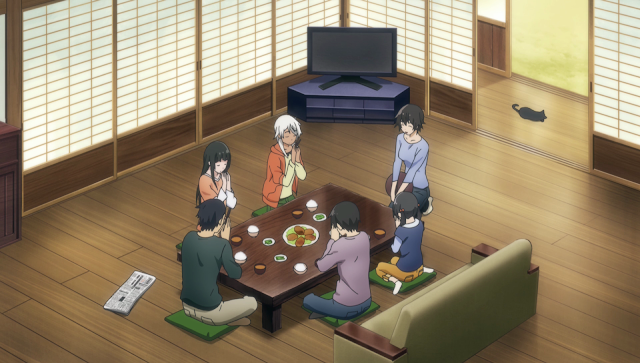 The first episode’s highlight is Chinatsu’s reaction following Makoto having taken her on a flight through the skies: from the moment Makoto sets her down, for a minute, she joyfully expresses delight at having flown and can be heard in the background even as the others are having a conversation: Nao is introduced here as one of Kei’s friend who runs the family liquor store. The soundtrack in Flying Witch is a joy to listen to, featuring gentle musical pieces that seem to speak volumes about the atmosphere and mood in Aomori. The soundtrack is set for release on May 25, two days before Girls und Panzer Der Film‘s home release hits the shelves. 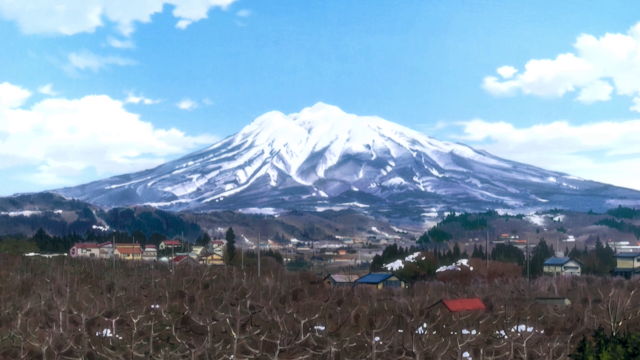 Far from being the remote, desolate site of a nuclear processing facility as seen in Terror in Resonance, Flying Witch presents Aomori as a much more welcoming place, and with due respect, Flying Witch probably has the more accurate, faithful representation of Aomori. 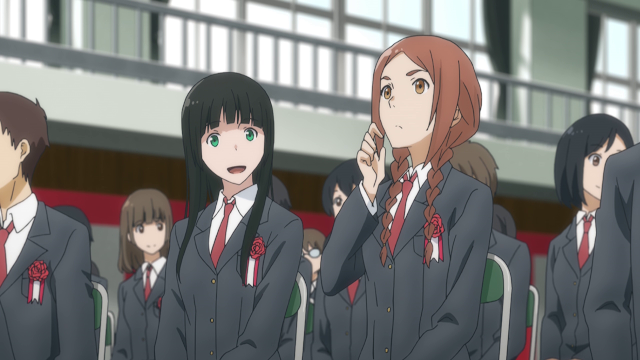 Makoto and Nao share a short discussion during their high school’s opening ceremony: these are typically held in April in Japan. Makoto is shown to have an uncommonly poor sense of direction, and earlier in the first episode, gets lost quite quickly until Kei corrects her heading. Because Kei is occasionally busy, he recruits Nao to help Makoto find her way home. A gentle and polite girl, Makoto insists on getting Nao a gift for accompanying her, and manages to locate a Mandrake: like the Mandrakes of Harry Potter, the Mandrakes of Flying Witch scream when unearthed, although the latter are white and more slender than their counterparts in Harry Potter, which are further characterised by the fact that the cries of a mature Mandrake are lethal to anyone who hears it (here, they merely scream loudly for a short period). The approach of spring in Aomori is shown to be a gentle one: while buds and greenery begin re-emerging into the landscape, vestiges of winter, such as snow and cold air, linger on. This is normally the case where I am, but the unusual weather patterns have meant it felt like summer for much of late March and early April. Whether or not this is attributable to global warming is not up for discussion in this post. 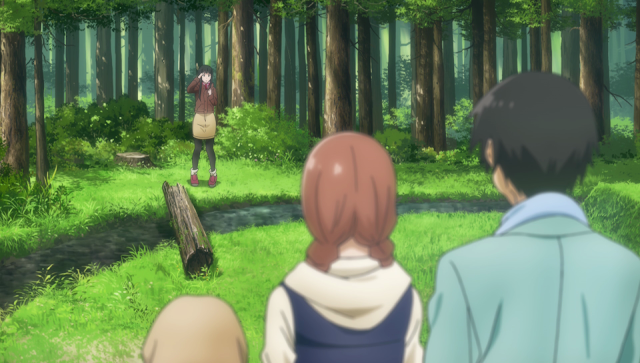 The Harbinger of Spring makes an appearance: resembling Slenderman, the Harbinger of Spring is a benevolent character who’s set out to meet Makoto. In spite of this, Chinatsu is frightened by his appearance and promptly retreats. Makoto shares a conversation with the Harbinger of Spring and offers him the Mandrake root from the previous episode, and in turn, the Harbinger of Spring gifts a bouquet to Chinatsu as apologies for having scared her earlier. The Harbinger of Spring’s gift to Chinatsu convinces her that individuals with unusual appearances might not be all bad; she wonders whether he’ll return next year. It’s a relatively simple lesson about reserving one’s judgement about others until one’s seen their actions, rather than appearance, and is cleverly incorporated into this episode’s events. Later in the episode, Kei introduces Matoko to fuki, a plant that can also be found in Europe. It’s quite bitter as a result of the alkaloid compounds, which can promote tumour growths and liver damage: the Japanese method of preparation involves treating it in baking soda and water to remove most of these toxins, thus rendering the bulbs safe to eat. However, the plant also has anti-inflammatory properties. Chinatsu’s reaction to the fuki bulbs is absolutely adorable. 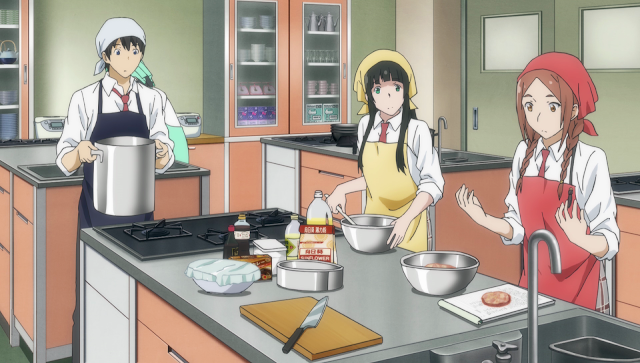 Later, Kei’s Pro At Cooking tips helps Makoto properly prepare them, and a cursory glance at some recipes shows that his suggestions are correct. Unlike Dave of Pro At Cooking, Kei properly walks Makoto through the preparation process and slings no insults (doing so would break the immersion). While we are on the topic of Pro At Cooking, only seven episodes were released, and it was meant to be a spin-off of Pure Pwnage. Pure Pwnage T3h Movie is the latest instalment: it premièred back in January and will be available for purchase in a few days. Fuki tempura is supposed to be quite bitter, but it’s probably not too bad, as Makoto enjoys several freshly-fried bulbs here. The plant has several beneficial effects: it can help with coughs, allergies and improves digestion. Moreover, the chlorogenic acid is thought to have anti-oxidation properties, and has been utilised as a natural remedy for asthma asthma, whooping cough, fever and spasms. Makoto’s witch training is quite diverse, suggesting that being a witch is multi-disciplinary in nature. 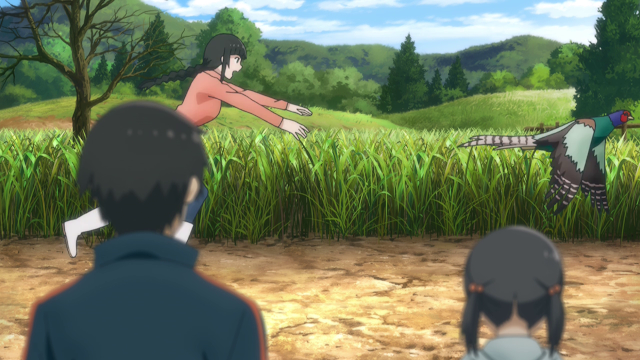 She de-weeds the field in the back of their yard the old fashioned way, and her approach is reminiscent of how K-On!‘s Mugi tried to open a baumkuchen cake during the movie. Makoto is voiced by Minami Shinoda, a newcomer on the block: this is her debut role, and so far, she’s done a fantastic job as Makoto. In fact, I would say that Minami Shinoda’s voice seems to have a quality similar to that of Minako Kotobuki (of K-On!‘s Mugi). Kei is also voiced by a new voice actor, although both their performances come across as being quite natural. Here, Makoto finds herself going off-mission when she sees a pheasant in the yards and proceeds to (unsuccessfully) capture it. 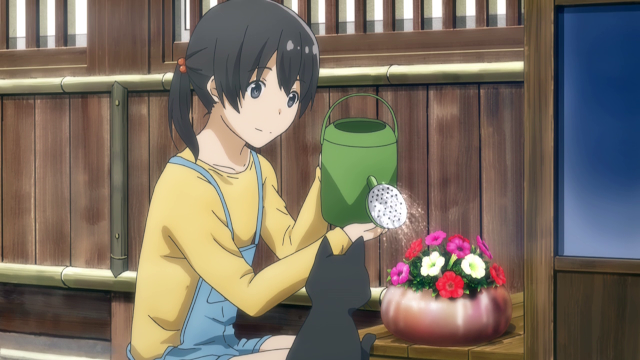 One of the more subtle elements in Flying Witch is the notion of persistent non-living entities that carry out through the anime: Chinatsu is watering the flowers that the Harbinger of Spring gave her. Attention to these details is often overlooked while watching an anime for the first time, but revisiting the episodes can find that minute elements have been given consideration to create a more plausible world. To the right is Akane, Makoto’s older sister. A witch who’s completed her training, she has a much more boisterous, forward personality compared to Makoto, but nonetheless cares deeply for her younger sister, taking the time to visit whenever the opportunity presents itself. By this point in time, Chinatsu’s become quite accustomed to magic and the supernatural, taking things in stride and eventually develops an interest to see these things for herself. After one of Makoto’s spells triggers, a murder of crows appear. The magic in Flying Witch is more explicit than that of Gandalf’s, but less direct than that of the Harry Potter universe, suggesting that spells have their limits. With this figure caption, the post comes to an end. I would have had this out sooner, but things have been rather busy as of late. They will settle out by Sunday; tomorrow is preparations for Saturday’s TEDx talks, and Saturday is devoted to the TEDx talks themselves. I’ve heard that Hai-Furi‘s fifth episode is to be aired on time, so I am pushing back the fifth episode talk to Sunday for the present. As for the Sniper Elite V2 review, that will be completed within a week or two. 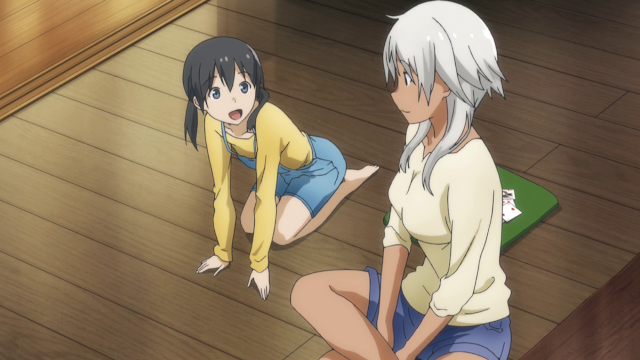 Because Flying Witch is this season’s slice-of-life anime with a novel component, it goes without saying that Flying Witch conveys a sense of relaxation similar to that of Non Non Biyori and Tamayura. Its magic comes from the sum of the character dynamics, beautifully-rendered settings and consistent (if slow) world-building surrounding witches and the supernatural phenomenon that the characters seem content to take in stride: Makoto’s excursions for witch training is quite diverse, and the breadth of her skills suggests that there’s more to being a good witch than just magic. Flying Witch is an anime that definitely is worth watching, and the slowly-paced depiction of Makoto’s daily experiences serves as a fantastic counter to the suspenseful Hai-Furi. 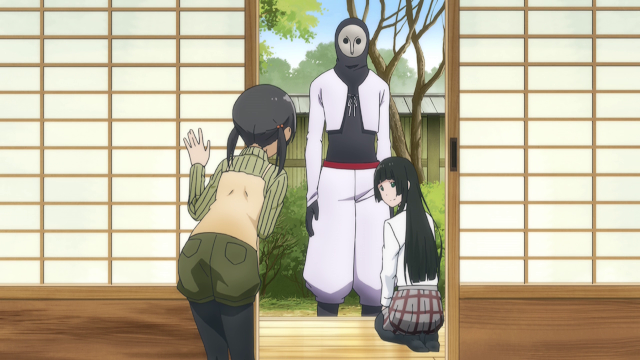 However, there is not really too much more that can be said about Flying Witch insofar (as far as thematic elements go); it should be clear that Flying Witch is not particularly conducive towards episodic reviews, and as such, I will return at the season’s end to see how Flying Witch turned out as a whole. In the blink of an eye, winter has passed by quite quickly, and we’re now around a month from spring, a season best known for rebirth, when the landscape comes alive as trees bud and flowers begin blooming. This also means that I’m now past the halfway point into the semester, which has been busier than any term I’ve experienced (as my previous posts incessantly attest). Consequently, Aokana is the only Winter 2016 anime that I’m up to date with; the others, I’ve not even reached the three episode mark yet. However, while my anime situation is a little bleak, the same is thankfully not true for my other commitments. Looking ahead to the Spring 2016 offerings, there are two television series that catch my eye: Hai-Furi and Flying Witch. In the movies and OVA department, Girls und Panzer Der Film occupies the spotlight (along with two new OVAs that are to accompany the movie’s home release), with Tamayura ~Graduation Photo~ also being of great interest. This lighter spring season for me will be gratefully accepted, as I continue to gear up in preparation for my thesis defense. Even with a Retina display, one would be hard-pressed to try and read the text from the image here, so as I’ve done for all previous season preview posts, clicking on it will bring up the full resolution version, which is optimised for 1080p displays. It’s a little surprising to reflect on the fact that four years have elapsed so quickly. Four years ago during the winter term, I was enrolled in introductory biochemistry, introductory cell and molecular biology and bioinformatics. That semester proved to be reasonably enjoyable, although it also left behind numerous memories: I fondly remember days where my classes ended before noon. As the semester drew to a close, I would come home earlier to study for exams and watched Angel Beats! during this time. So much has happened since then, and it will be interesting (as well as intimidating) to see where things will go over the next four years. Now, we return to regular programming. After plate tectonics resulted in major portions of landmass receding beneath the oceans, Japan created a new initiative to save the remaining nations. To this end, the Blue Mermaids were founded to keep the seas traversable, and aspiring to be Blue Mermaids themselves, childhood friends Misaki Akeno and China Moeka enroll at Yokosuka’s Marine high school with the shared goal of turning their dreams into reality. 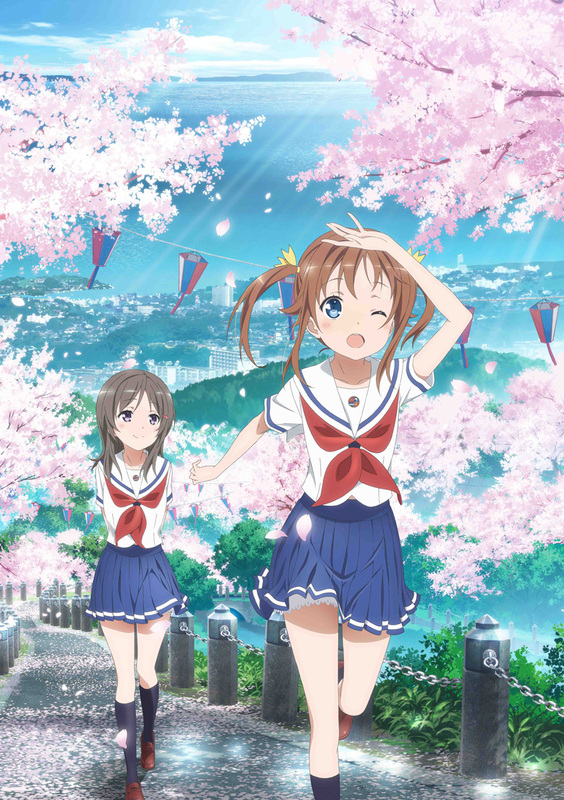 The combination of moé elements and a unique world ripe with opportunity for world-building means that Hai-Furi could be similar to Sora no Woto in terms of atmosphere, exploring the consequences of a world following major tectonic activity through the viewpoints of two optimistic youth. Moreover, while the premise only describes two of the protagonists, there do seem to be a large number of characters, all of whom might play a role later on in the anime. Aomori is a northern region in Japan blessed by nature’s bountiful beauty, although it is here that bizarre events begin occurring. This brings 15-year-old Makoto Kowata, a witch, to the region. 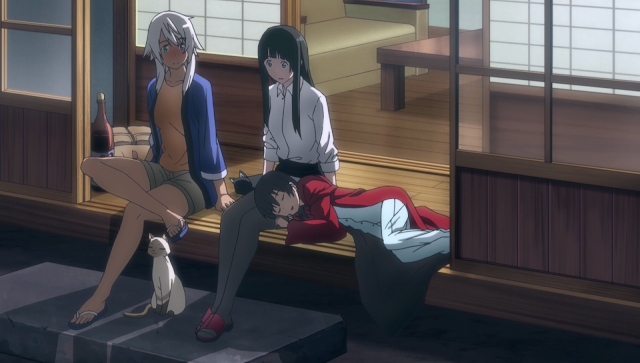 Leaving Yokohama with Chito, her black cat, she takes up accommodations with her relatives in Aomori and begins investigating these mysteries while training to become a more capable witch. Aomori is, in my opinion, one of the more mysterious places in Japan for its relatively low population density and remoteness. 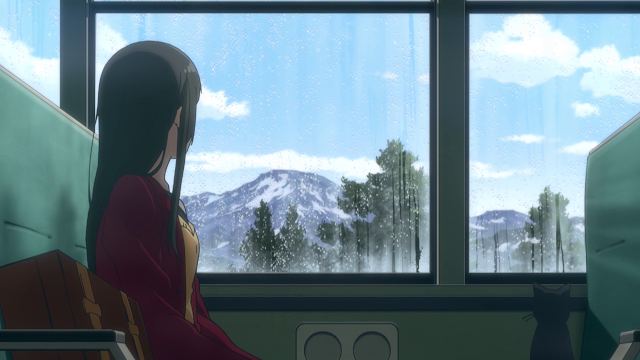 In short, it appears to be the perfect place for a mystery to take place, and admittedly, I am interested in Flying Witch on the rather superficial basis that I would be quite interested to see a fictional depiction of a prefecture otherwise not widely used in most anime.